An 83-year-old man has been left devastated after his dog had to be put down following a vicious attack from another dog. Bill Woollon popped out to give pet dog Max a quick walk at about 3.45pm last Saturday (July 14) when a much larger dog came out of nowhere and set upon Max in a play area off Meadow Sweet Road, Rushden. The pensioner thinks the dog which ripped into Max was a mastiff cross. His daughter Ashley Fett said: “He just absolutely mauled my dad’s little dog. In trying to protect Max, Bill was injured himself but still took Max to the vets before going to the hospital for treatment for his wounds. While the police took a statement from Bill following the attack, Ashley is worried that the dog who killed Max is still out there and could strike again. Her fears relate not just to other animals, but to children too as she says there are a lot of families who live on the estate. She said: “I am worried about any children playing out. Last weekend’s attack has really affected the family, with Ashley adding: “My dad is devastated. “Max was their life, he was nearly 13. But despite the sadness of losing Max, there has been a lot of support for Bill in the days following the attack. 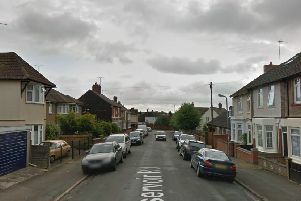 A spokesman for Northants Police said: “We were called about an incident on July 14 at 3.45pm when a man was walking in Meadow Street Road in Rushden when another dog came along and attacked his dog. The spokesman added that they are appealing for witnesses and would like to hear from anyone who saw the attack to call the police on 101.